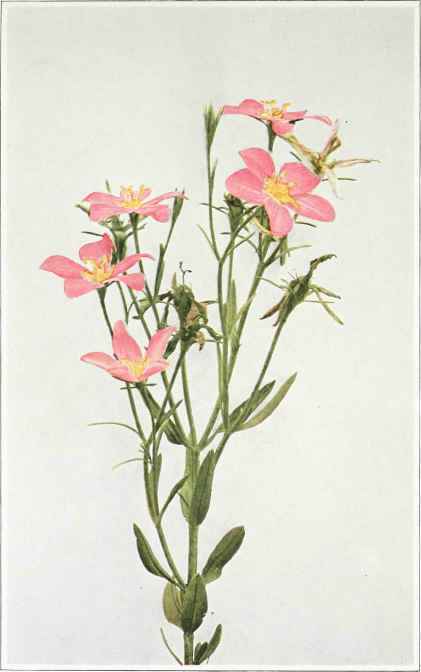 A small, herbaceous plant with stems slightly four-angled below, 5 to 20 inches high and with numerous alternate branches toward the summit. Leaves oblong-lanceolate to linear, opposite, sessile, blunt at the apex, the lower leaves usually smaller and obovate, the upper ones narrower and smaller. Flowers numerous, three-fourths to 11/2 inches broad, each flower at the apex of a branch or slender stalk. Calyx without distinct ribs, its lobes, usually five in number, narrowly linear, usually somewhat shorter than the five oblong or obovate corolla segments. Corolla pink with a yellowish, starry eye, bordered with red, rarely the entire corolla white; style two-cleft to below the middle. Fruit a small capsule about one-fourth of an inch high. In and around salt meadows near the coast, from Massachusetts to Florida. Flowering from the latter part of July until September. The Slender Marsh Pink (Sabbat ia campanulata (Linnaeus) Torrey) with calyx lobes as long or longer than the corolla, and with narrower leaves, is also found in salt meadows along the coast.